Discussion in 'Central – From Da Nort Woods to the Plane States' started by Cannonshot, Jan 14, 2009.
fingers crossed for Oconto cnty. I ride there a lot as there's a lot of riding to be had. Marinette cnty to the east as well. fingers crosser for Oconto cnty. I ride there a lot as there's a lot of riding to be had. Marinette cnty to the east as well. They were going do something with it on March 4th. I saw the Forester and the Chairman of the committee this week. However, the ATV clubs want to take the issue to their members and they won't be able to do that prior to the March 4th meeting. The issue won't be decided until the April meeting at the earliest. How are these things presented to the atv groups, any idea? If they atv people say they don't want motorcycles on 'their' trails, I assume their opinions are advisory only. It is, after all, public property and some people with other goals than exlusivity likely have other ideas (making money). I ride mainly around the Mountain area. I know the area as I grew up at a family cabin between Mountain and Crooked Lake. Sadly the cabin is no more. This area offers some good (free) campsites centrally located to some awesome riding. From past (several years ago) personal experience the ATV folks around this area were not the most positive about DS bikes. However, at the moment, there are enough roads that are also ATV trails that are fun to ride which connect different portions of the Pipeline. Namely Pipeline road just south of hwy 64. Sporty sand to say the least. ATV's are not allowed on the majority of the Pipeline. Here are some things I cover. We can talk about other things when I see you next time. I point out that the trails use public land and that they are an investment that the county made to create an attraction that should benefit multiple stakeholders. Those stakeholders include the business people that should be benefitting from increased tourism as a result of this investment of county land. County economic development people are constantly working to get more tourist traffic. We are a group that is ready to go right now simply by flipping the "OK switch". I also point out that residents that are motorcyclists are also stakeholders that should not be denied access to the public land. I emphasize that motorized users are the same family and that many ATV and snowmobile riders are also motorcyclists. I emphasize that not being able to ride in mixed groups (families on ATVs and bikes) means that families go elsewhere with their recreation dollars. They point out that clubs bring the money and that we would be riding for "free". I point out that other groups are allowed on the trails that don't have a sticker program, that we do contribute to trails via federal gas taxes returned under the Rec Trail Program, and that we are soon going to have a sticker program of our own that will allow payments to support trails. Sometimes I have to answer concerns that we would cause excessive wear and berming on the trails and that it would be a huge safety issue to mix conveyances. Don't bother commenting on those, I cover all that. I also point out that many of the ATV trails in the state are already open to dual sport and there are no significant problems there. In a county that has part of their trail system on federal land, I point out that a portion of their trail system is already open to us without any problems and opening the remaining portion is a small step that makes sense since there would be a uniform set of rules for the entire system. Some people with wisdom tell me that when ATVs first showed up the snowmobile people said all kinds of stuff about them as well. There are a lot more issues and points I deal with, but you get the idea. I have a bunch of tracks for riding in that area. 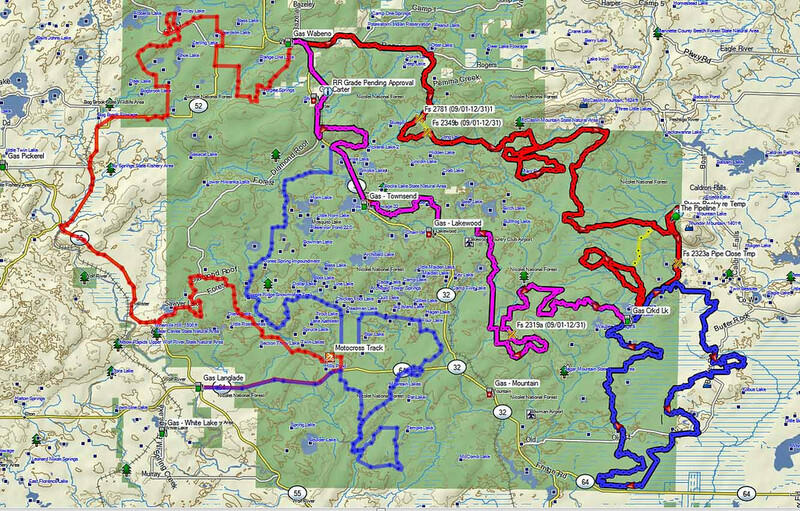 Since the portion of the county trail system in the NF is open to us I incorporate that into the loops. He is one ride that covers a lot of that area. When I went to develop this ride I scouted about every potentially usable path that was open to us. Then I took the better stuff and included it in the loops. It looks like some of the darker/heavy blue tracks are on Bachman RD/2107. I have some more stuff that covers Hwy64 and south I can get to you at some point if needed. Some loop stuff but also some of the last true off-road/dirt if heading south/home. You can send me anything you have, but I've probably got it already. Like I mentioned, I covered almost all paths that are open to us when I scouted. These loops are just one product from that. I've got some other stuff that runs in the area as well. Working with one county's economic development office today. Just wrote a paper that they can use with their Chamber of Commerce to encourage them to promote our recreational interest in that county. Economic development and business people tend to support our interests. That's great! Get more of the public voicing their opinions favoring your ideas! What county? Edit: Looks like I'll need to go up there for a meeting. Hope it warms up soon, so you can start riding your bike to these meetings. Sure would save some gas money. For sure. It takes up a lot of time, but it also costs me some serious coin out of my own pocket. We've managed to penetrate the silent sports capitol of the north - Vilas County. This promotion is from their official county travel literature. They contacted me about this last fall. County Board Chairman called me today to discuss issues in the area. Very positive. Going to hit a regional meeting up that way next week. He also suggested I make a presentation to another committee up there. Paperwork sent off. Hopefully my youth doesn't haunt me now. This isn't local, but it is of interest to many of you locals. The NPS wants to restrict access to the White Rim and Elephant Hill Roads (Moab). This can be a problem for people that want to try to get a chance to ride them during a Moab visit. Consider that commercial outfitters will be vying to vacuum up available permits. Best to comment that this is a bad idea since it is too restrictive effectively making it a closure of sorts. These are roads and they have the carrying capacity for more than what is going to be allowed. Also, I don't see the need to restrict motorcycle group size to three bikes. So four or five of us couldn't ride together in a group . . . Thanks for the heads up Sir. Just fired off a digital comment from their site. They make it rather easy so no excuses people. Having been on these roads I can honestly say you don't want to be restrictive with motorcycle groups. NPS wants to keep it to three and personally I find that unsafe if one has trouble and another has to leave for assistance. It's a great ride and everyone should give it a shot but I think motorcyclists are a bit more self policing than NPS gives them credit for. Just sayin'. This is in Utah so it occurred to me that Cannonshot's awareness of our struggles has no boundaries. Pretty cool huh?